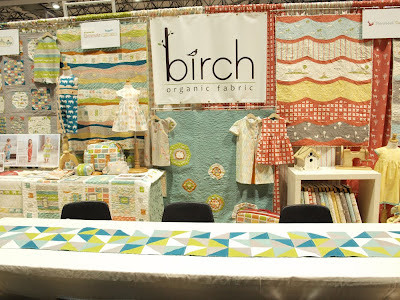 Here are a few pictures of some of the things I made for Birch Fabrics. Getting to design quilts around the new fabric lines is one of my favorite things to do. I am even going to make the big jump and start selling these patterns. They will be available next month. Don’t worry, I will keep you posted. Below are two versions of By Sea or By Land, a quilt pattern inspired by the new Storyboek 2 line. Here is a wide angle shot of the booth. I made the quilt on the far left, the table runner and the bags on the left hand side. 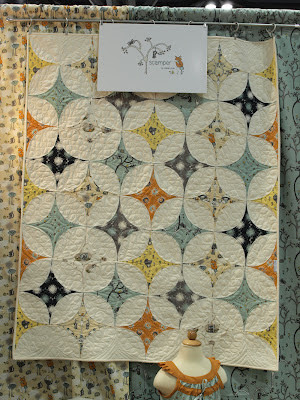 And here is the Scamper Diamond Quilt. I am so in love with this baby and how it blends classic and modern. I will also be releasing a pattern for this in July. You can check out all the pictures over at Birch’s blog. 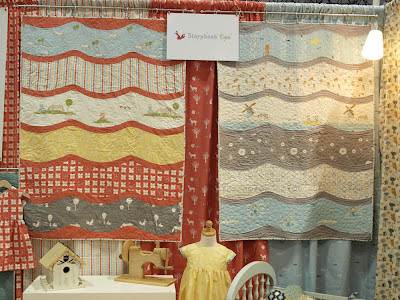 These quilts are AMAZING!!! Beautiful work! Thanks Kristin! Good luck winning over at Amber’s giveaway. If you don’t win ; (, you can head over to my etsy shop and pick one up. Let me know if you have any questions and I can’t wait to see pictures of your finished. quilt.